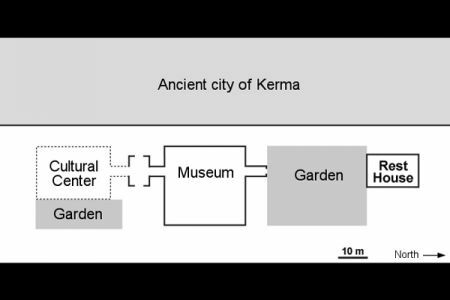 The museum was born of the High Committee for the Kerma Cultural Complex initiative. Founded in 1999, this Sudanese committee has for goal the protection and the promotion of the region’s past. Together with the National Corporation for Antiquities and Museum (NCAM), the committee supervised the construction work started in 2003 with the erection of the monumental entrance located in front of the ancient city’s deffufa. Local and regional businesses were contracted out and financing was assured by a Sudanese-Swiss partnership. The museum’s first inauguration was held on January 19, 2008, and attended by local and national authorities. The museum has become a major cultural venue for the inhabitants of Kerma, who value the enhancement of Nubian history and the role the museum plays in the development of the region. The building is inspired by traditional Nubian architecture with a vaulted roof; the many vaults are pierced by triangular openings that allow daylight into the museum galleries. While certain rooms are administrative offices and workspace for the curators, the majority is dedicated exhibition space. North of the museum, a secondary entrance gives access to a small hotel and garden reserved for passing tourists. 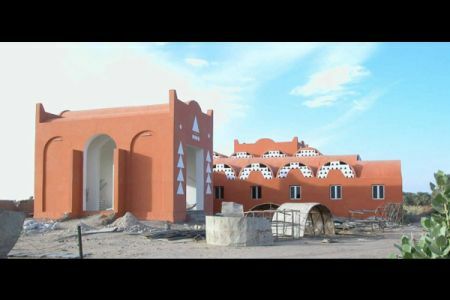 South, a cultural centre for Nubian studies is currently under construction.